Tesla Motors has sent out a software update for the Model S which tweaks the car’s Autopilot feature, as well as adding a feature allowing owners to autonomously park and “summon” the car. Update v7.1 of the Autopilot software on the Model S will now allow owners to instruct their cars to pull into or out of parking spaces autonomously via the key fob, according to Motherboard. The feature is similar to something BMW included with the newest 7-series, but that system required the owner to manually guide the car into the spot — Tesla’s has the car take care of it all on its own. That’s right; if your Model S has a garage door opener connected to the garage door via a HomeLink connection, the car will autonomously open the obstructing door on its own, park itself, and the close the garage door behind itself. It will even park the car in reverse! It will do the same in the opposite order if its parked and the owner “summons” it. You can see the necessary settings in the second video above, including customizable settings like a variable stop distance and an allowance for parking in tight spaces. The car appears to require being lined up in front of the space for the feature to work, on “flat driveways,” and with the user and key fob within close proximity. The feature can be stopped at any point in the process by pressing the center button on the key fob. The update also allows the Model S to park in traditional parking spots that are perpendicular to the curb, like at most Tesla charging stations at supermarkets and shopping centers. 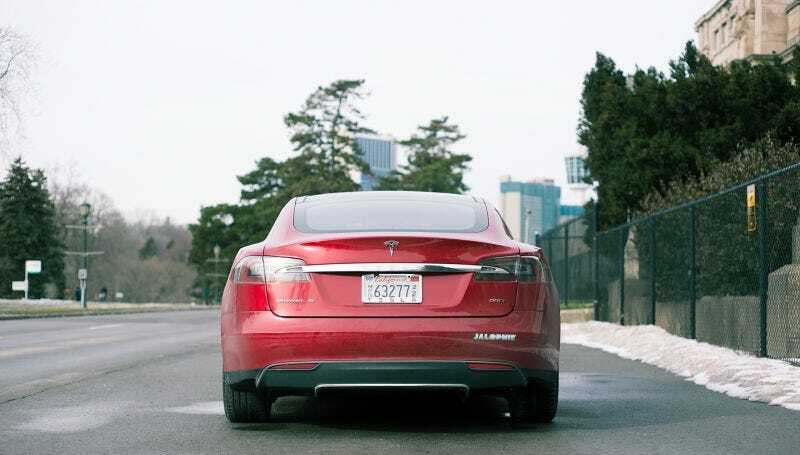 The v7.1 software update will also tweak the Autopilot system on the Model S, restricting the vehicle to only five mph over the listed speed limit and with a person in the driver’s seat on roads in a residential environment and/or roads without a center divider. The updated software, in addition to the crazy parking upgrades, can now determine the types of vehicles around it on the road, as well as better lane adjustment when passing gaps in road markings (think highway exits), or in environments with faded markings. We were sort of blown away when we tried Autopilot for the first time back in October, and some lucky Jalopnik staff currently have a Model S on their road trip to Detroit, putting Autopilot through its paces and getting sold on the thought of a semi-autonomous future. Elon Musk is promising us fully-autonomous capability in just two years — and it’s starting to look like that was more than just a marketing proposition. You can check out the full list of update notes thanks to NOLA_Mike on TeslaMotorsClub.